maple bacon and beavertails: rainbows & unicorns. one endearing quality that i embody is that of a 'starving artist' and how i wish i could go back to the days that my biggest decision would be what medium i was going to choose; watercolour, oils, pastels? now my days are filled with decisions of what to feed children for lunch, how to expand their ever-growing minds, and how to mold these tiny nuggets into upstanding citizens of their surrounding peers. pretty sure i'll go back to deciding which medium to use & what my inspiration of said masterpiece is going to be. i can't tell you how proud i am of my junior art apprentice. one extremely exciting quality that mr man k exudes is his eye & love for art. he is definitely a "colour-er" and loves to draw. his drawings are becoming more intricate and lately he's been drawing actual pictures, portraits for lack of a better word, &you can actually tell what they are as opposed to his original works of art which screamed abstract. colours & lines, shapes & patterns, nothing defined purely a piece of mood/personality. now these? these are actual portraits. people, places, things; it's absolutely amazing. recently k took to drawing people. although they are still those original stick people with overly large heads, they still paralleled the shape of a person & with unique attributions you can totally tell whom he is creating. now? now he is drawing one of mommas favourite creatures. unicorns. being sure to include their attributes correctly & discuss exact colours, features, and placement of said attributes. hello their horn & colours have to be just right. right? below is last night's masterpiece, we shall call it unicorn sitting upon a rainbow. swoon. i think have a mini-matisse on my hands & a follower in mamas footsteps which means maybe i can get back into it.. right? riiiiight??? okay, so maybe my enthusiasm is premature, but c'mon peeps. do you see this gold? ah-ma-zing. 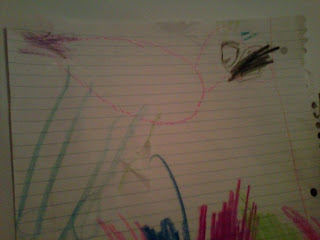 the nugget is drawing, making this mama proud & i have works of art popping up all over the fridge.